Small Group Tour- Maximum 35 members! 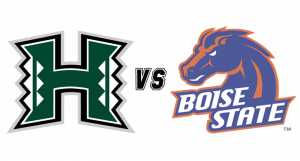 Its football Saturday at Alberstons Stadium, home to the famous blue “Smurf” turf football field as the Rainbow Warriors battle the Broncos of Boise State University. The atmosphere around the stadium on game day is electric. Once you get into the stadium, an entire field in blue, the only blue astro turf in the world. Only seeing with your own eyes, do you appreciate the true flavor of this blue field. Lay your eyes upon it and its WOW! And then, the amazing views from the stadium, treetops, the capital building, downtown Boise, and the mountains in the distance. It is breathtaking. Our hale for this football weekender is the Hampton Inn & Suites Boise-Downtown, the perfect spot to enjoy this vibrant city. Walk just a few minutes and you are in BoDo, the South 8th Street Historic District, offering a variety of shopping, entertainment, and over 80 restaurants. We have also included a half-day guided tour for local sightseeing as well to capture the beautiful fall colors. Its peak foliage season, so bring along your camera! Come, join us on this fun-filled UH weekender tour. Round trip air via United Airlines from Honolulu. Four nights at the Hampton Inn and Suites Boise-Downtown. Final payment due by July 8th , 2019. Package is non-refundable after this date. Baggage fees are additional and payable directly to United Airlines at check-in. Current fees are $30 for the 1st bag and $40 for 2nd bag. Starting from $1,295 per person quad occupancy (4 persons sharing existing bedding). Starting from $1,395 per person triple occupancy (3 persons sharing existing bedding). Starting from $1,895 single occupancy. 10/09/19 – Depart Honolulu on United Airlines flight 372 at 7:00 am and arrives in San Francisco at 3:00 pm. 10/09/19 – Depart San Francisco on United Airlines flight 5577 at 5:00 pm and arrive Boise at 7:42 pm. 10/13/19 – Depart Boise on United Airlines flight 5358 at 7:00 am and arrives in San Francisco at 8:08 am. 10/13/19 – Depart San Francisco on United Airlines flight 1175 at 9:01 am and arrive Honolulu at 11:20 am.